Two military heroes associated with Heaton have been honoured in separate ceremonies in Newcastle. Firstly, on 29 August 2017, Edward Lawson was one of three recipients of the Victoria Cross to whom a new memorial was dedicated. Monument to Newcastle’s VC winners including Edward Lawson, who lived in Heaton for many years. Then, on 23 September 2017, another adopted Heatonian, Company Sergeant Major John Weldon DCM was honoured at a ceremony on the Quayside. Edward Lawson was born on 11 April 1873 at 87 Blandford Street, Newcastle (within yards of the spot where his memorial now stands). His father was a cattle drover. 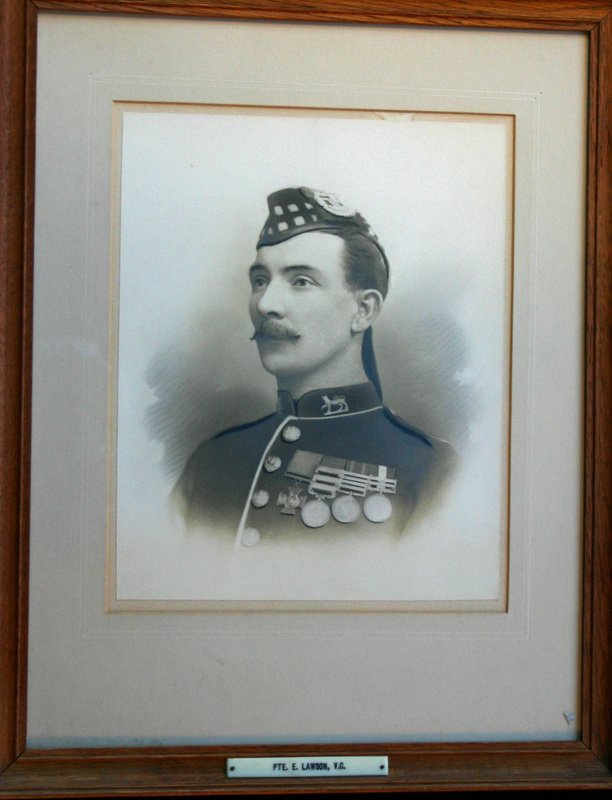 As a young man of 17, Edward joined the Gordon Highlanders. In the 1890s the regiment was called into active service on the North-West Frontier province of what was then known as British India. On 20 October 1897, a famous battle was fought at Dargai Heights, at which 199 of the British force were killed or wounded. 24 year old Edward Lawson carried a badly injured officer, a Lieutenant Dingwall, to safety. He then returned to rescue a Private McMillan, despite being wounded twice himself. He, along with a colleague, Piper George Findlater, was awarded the Victoria Cross for bravery. Edward’s award was presented to him personally by Queen Victoria at Windsor Castle on 25 June 1898. He then returned home to work in the East End Hotel in Newcastle (or, as we now know it, the Chilli!). According to military records, Lawson soon returned to his regiment and served until 31 October 1902, including in South Africa during the Second Anglo-Boer War. He received further military medals and clasps for this period of service. On 14 March 1908, Edward married Robina Ursula Scott. At this time, he was living at 128 Malcolm Street and working as an electrical wiremen. The Lawsons soon moved to 14 Matthew Street, South Heaton just north of Shields Road, where they brought up their six children. Matthew Street was their home until c1924 (when Edward was 51 years old) at which time they relocated to Walker where they were to live for the remainder of their lives. 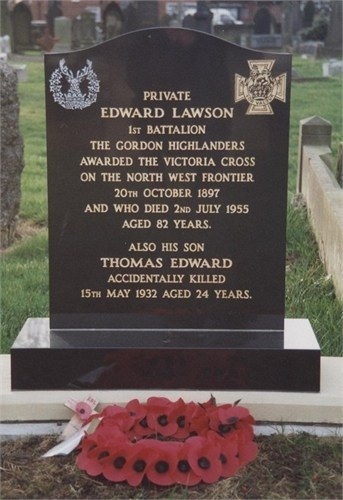 Edward Lawson VC died on 2 July 1955. He is buried in Heaton and Byker Cemetery, where in 1999 a new headstone was erected on his grave. His Victoria Cross is held by the Gordon Highlanders Museum in Aberdeen. On 29 August 2017, a memorial of grey granite was unveiled outside the Discovery Museum. It bears individual plaques to Private Edward Lawson VC along with Newcastle’s two other recipients of the gallantry award: Captain John Aiden Liddell VC, MC and Private Adam Herbert Wakenshaw VC. Her Majesty’s Lord Lieutenant of Tyne and Wear, Mrs Susan M Winfield OBE, presided, assisted by Lord James Percy, Honorary Colonel Lord James Percy of The Royal Regiment of Fusiliers. Members of Edward’s family were in attendance. You can read more and see photographs relating to Edward Lawson here. John Weldon was born c1885 in Stannington, Northumberland. By 1901, he was living with his family at 44 Chillingham Road, Heaton, and was working as a signalman on the railways. In 1912, he married Isabella Laidler and the couple were living at 48 Mowbray Street. The next year, their only child, Margaret Isabella, was born. Sadly she was not to get to know her father. When she was only one year old, World War One was declared and John was recruited by Northumberland Fusiliers into its 16th Battalion, a so-called ‘Pals’ regiment, known as ‘The Commercials’. John had, by now, been promoted to the rank of Company Sergeant Major. Along with his comrades, he was on active duty on 1 July 1916, the first day of the Battle of the Somme. On this day, 1,644 Northumberland Fusiliers were among 19,240 British soldiers who died in just a few hours. 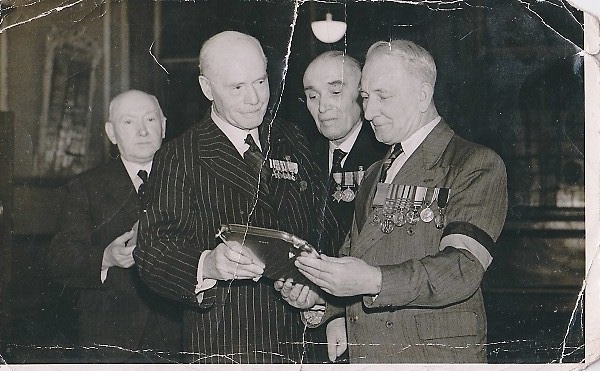 Just over a year after that tragic day, John Weldon was given a ‘Hero’s Reception’ at the Newcastle Commercial Exchange (The Guildhall) on the Quayside in honour of his being awarded the Distinguished Conduct Medal. The Sheriff of Newcastle, Arthur A Munro Sutherland reported that Weldon’s company went over the top at 07:30am and when all the officers were out of action, he took charge of the company. He did not return to the trenches until 10:45pm after lying out in ‘No Mans Land’ under continuous heavy fire. He was known to have killed or wounded 29 Germans. His rifle was twice shot out of his hands. At a later stage in the afternoon he crawled from shell hole to shell hole and was able to collect 15 badly wounded men and get them back to the British trenches. John soon returned to the front. But on 22 September 1917 CSM John Weldon DCM was reported wounded and he died the following day at the 14th Hospital at Wimereux, aged 32. He is buried in the Communal Cemetery there. Northumberland Fusiliers Museum and archive now has John Weldon’s Distinguished Conduct Medal in its collection and he is listed in ‘Historical Records of the 16th (Services) Battalion Northumberland Fusiliers’ by Captain C H Cooke MC for the Council of the Newcastle and Gateshead Incorporated Chamber of Commerce, The Guildhall, Newcastle, published in 1923. He is also mentioned on the war memorial of Nedderton Council School, Northumberland where he had been a pupil. Locally, he was among the 950 servicemen listed on the St Mark’s Church, Byker war memorial (now Newcastle Climbing Centre) but the whereabouts of this memorial is currently unknown. On 23 September 2017, a hundred years after his death, on a still, sunny autumn morning by the River Tyne, about fifteen regimental representatives, including flag bearers and two buglers, along with members of the general public remembered the bravery of CSM John Weldon DCM. Ian Johnson, the local WWI historian, was the wreath layer, in the absence of John Weldon’s great-great nephew George Patterson, who unfortunately was unable to attend. Ian Johnson, author of ‘Newcastle Battalion World War One’ and Arthur Andrews of Heaton History Group, who has researched the life of CSM John Weldon, at the ceremony. You can read more and see more photographs relating to CSM John Weldon DCM here. Private Edward Lawson VC and Company Sergeant John Weldon DCM, Heaton remembers you. This entry was posted in Group Activites, Research and tagged Chillingham Hotel, Chillingham Road, East End Hotel, Edward Lawson, Heaton and Byker Cemetery, John Weldon, Malcolm Street, Matthew Street, Mowbray Street, soldier, Victoria Cross, WW1 on September 26, 2017 by oldheaton. This Distinguished Conduct Medal was awarded to John Weldon, who lived most of his short life in Heaton. The medal is now in the collection of the Northumberland Fusiliers Museum and Archive at Alnwick Castle. John’s name, rank and service number (16/305) is engraved around the curved surface. The Distinguished Conduct Medal had been established by Queen Victoria in 1854 and was awarded to non-commissioned officers for ‘distinguished, gallant and good conduct in the field’. 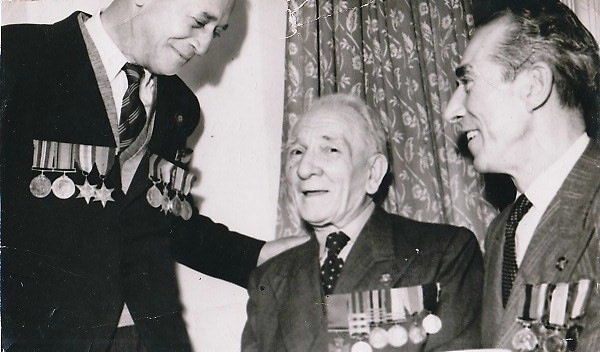 It was the second highest award for gallantry in action after the Victoria Cross. John Weldon was born c 1885 in Stannington, Northumberland to parents, Margaret and John, a North Eastern Railways signalman. In 1891, he appears on the census as the fifth of seven children. By 1901, the family were living at 44 Chillingham Road, Heaton. Both John and his older brother, Thomas, had followed in their father’s footsteps, with responsible jobs as signalmen at the tender ages of 17 and 15 respectively. The 1911 census shows that John’s mother had given birth to 11 children, seven of who survived. John senior was now working as a railway porter and his wife was a shopkeeper. John junior had a new trade: a joiner and carpenter. The following year, he married a Newcastle girl, Isabella Laidler, and the couple were living at 48 Mowbray Street. The next year, their only child, Margaret Isabella, was born. Sadly she was not to get to know her father very well. 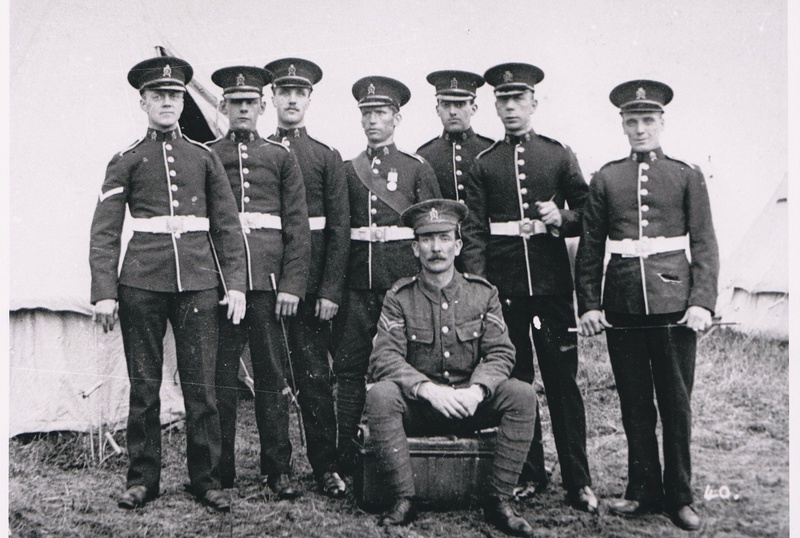 When his daughter was only one year old, World War One was declared and John was recruited by Northumberland Fusiliers into its 16th Battalion, a so-called ‘Pals’ regiment, known as ‘The Commercials’, formed in August 1914. An ’embarkation roll’ dated 23 November 1915 survives, which shows that John was a member of ‘B Company’. We know that he was awarded the Mons Star medal, available only to veterans of the 1914/15 campaigns in France and Belgium. A history of the regiment confirms that the battalion landed in Boulogne on 22 November 1915. John had, by now, been promoted to the rank of Company Sergeant Major, which is the senior non-commissioned soldier of a company. He would have been responsible for, amongst other things, the supply of ammunition, evacuating the wounded and collecting prisoners of war. Along with his comrades, he was on active duty on 1 July 1916, the first day of the Battle of the Somme. On this day, 1,644 Northumberland Fusiliers were among 19,240 British soldiers who died in just a few hours. Zero time was fixed for 7:30am…A and B Companies moved forward in waves – instantly fired on by machine guns and snipers…The enemy stood on their parapet and waved to our men to come on and picked them off with rifle fire…The enemy’s fire was so intense that the advance was checked and the waves or what was left of them, were forced to lie down. C company moved out to reinforce the front line, losing a great number of men by doing so… At 7:40 the reserve D company were ordered to advance. Getting over the parapet the first platoon lost a great number of men. As a result the remainder of the company was ordered to ‘stand fast’ and hold the line… At 08:20 the 16th Lancashire’s were asked to reinforce 16th NF in front line. At 09:30 message received from Mortar Battery to say they their gun had been unable to fire since 08:15 due to a lack of ammunition, but some had now arrived… The enemy’s artillery continued firing all day. Our artillery fired all day but it was only occasionally that it appeared heavy and effective… It was reported that the men of the attacking companies moved forward like one man until the murderous fire of the enemy’s machine gun forced them to halt… Not a man wavered and after nightfall we found in several places, straight lines of ten or twelve dead or badly wounded as if the Platoons ‘Had just dressed for Parade’… At 09:00pm orders received to withdraw men who lying out as it was dark. At 11:00pm the relief by another regiment was complete and the remnants of the battalion – 8 officers and 279 other ranks got back at 01:30am. And just over a year after that tragic day, John Weldon DCM, was given a ‘Hero’s Reception’ at the Newcastle Commercial Exchange (The Guildhall) on the Quayside, which was reported in the Newcastle Daily Journal, Thursday, July 12, 1917. The Sheriff of Newcastle, Arthur A Munro Sutherland (a ship owner, who became Lord Mayor in 1918 and was later to own the Evening Chronicle for a short time) presided. He reported to the assembled throng that Weldon’s company went over the top at 07:30am and when all the officers were out of action, he took charge of the company. He did not return to the trenches until 10:45pm after lying out in ‘No Mans Land’ under continuous heavy fire. He was known to have killed or wounded 29 Germans. His rifle was twice shot out of his hands. At a later stage in the afternoon he crawled from shell hole to shell hole and was able to collect 15 badly wounded men and get them back to the British trenches. Throughout that terrible day, Sutherland concluded, the conduct of Weldon was magnificent. Three cheers were given and Company Sergeant Major Weldon acknowledged the kind things said about him. Colonel Ritson of Northumberland Fusiliers also spoke in high praise of Weldon’s gallantry and said that he would be returning to his battalion at the front. He did. But on 22 September 1917 another article in the Newcastle Daily Journal, reported that CSM John Weldon DCM had been seriously wounded in the shoulder, arm and side but was reported to be ‘doing well’. Sadly, the following day, Company Sergeant Major John Weldon died as a result of his wounds in the 14th Hospital at Wimereux, aged 32. He is buried in the Communal Cemetery there. As mentioned previously, Northumberland Fusiliers Museum and archive now has John Weldon’s Distinguished Conduct Medal in its collection and he is listed in ‘Historical Records of the 16th (Services) Battalion Northumberland Fusiliers’ by Captain C H Cooke MC for the Council of the Newcastle and Gateshead Incorporated Chamber of Commerce, The Guildhall, Newcastle, published in 1923. He is also mentioned on the war memorial of Nedderton Council School, Northumberland where he had been a pupil. Locally, he is among the 950 servicemen listed on the St Mark’s Church, Byker war memorial, situated in what is now Newcastle Climbing Centre on Shields Road. We did wonder whether Weldon Crescent, built in High Heaton between the wars, might commemorate him but it seems much more likely that, like most of the surrounding streets, it was named after a small settlement on the River Coquet in Northumberland. Researched and written, as part of Heaton History Group’s ‘Shakespeare Streets’ project, by Arthur Andrews with additional input from Chris Jackson. Special thanks to The Northumberland Fusiliers Museum archivists, Alnwick Castle and to Anthea Lang, who found John’s name on St Mark’s war memorial. If you are related to or know more about John Weldon, have a photograph of him or have found his name on a war memorial, we would love to hear from you. You can post directly to this website by clicking on the link directly below the title of this article or alternatively email chris.jackson@heatonhistorygroup.org. Read here about a ceremony to mark John’s bravery and the centenary of his death. This entry was posted in Group Activites, Research and tagged Chillingham Road, John Weldon, Mowbray Street, railways, Shakespeare, Shields Road, soldier, WW1 on January 3, 2017 by oldheaton. The Victoria Cross is the highest military decoration ‘for valour in the face of the enemy’ awarded to British and commonwealth servicemen. It was founded by Queen Victoria in 1856 and to this day only 1,357 have been awarded worldwide. The simple words ‘For Valour’ are inscribed on it. One man so honoured lived and worked in Heaton for many years and is buried in Byker and Heaton Cemetery. Edward Lawson was born at 87 Blandford Street, near the centre of Newcastle on 11 April 1873. His father, Thomas, is described in the 1881 census as a ‘cattle drover’. 24 year old Edward Lawson carried a badly injured officer, a Lieutenant Dingwall, to safety. He then returned to rescue a Private McMillan, despite being wounded twice himself. He, along with a colleague, Piper George Findlater, was awarded the Victoria Cross for his bravery. The award was presented to him personally by Queen Victoria at Windsor Castle on 25 June 1898. 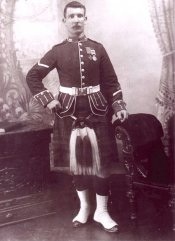 Piper Findlater, the other recipient, was shot in the feet but continued to play his pipes to encourage his battalion’s advance. This act of bravery was widely covered in the press back home and Piper Findlater became a very well-known public figure. On his return to Scotland, much to the consternation of the military and political establishment, he capitalised on his fame and for a while supplemented his army pension by performing in music halls. He went on to be celebrated in literature, art and music. I heard Sergeant Ewart questioning Lawson about the affair: ’Did you know the danger you were in?’ Lawson said: ‘No, I didn’t know what I was doing.‘ …Lawson was always a decent fellow but very rash and reckless: he would stick at nothing… He was made quite a god of in the regiment. The Aberdeen Weekly Journal (22 June 1898) reported that the Newcastle Evening Chronicle had interviewed him on his return to Newcastle and found ‘a modest, unassuming man, little disposed to talk of his own exploits’. By this time, the paper says, he had completed his period of service and was back home in Newcastle working in the East End Hotel, Heaton. (Does anyone know where this was?*). Official records describe him as a ‘Reservist’ at this time. The article goes onto describe his military career. After enlisting, Private Lawson had been posted to Aberdeen and after 5-6 weeks training, he was transferred to Curragh Camp in Ireland. He remained in Dublin for about 5 months. He was sent to India in March 1893, where he remained until his discharge. Lawson said that he received ‘a couple of scratches’ during the episode for which he was honoured. And seemingly the action for which Lawson received the Victoria Cross wasn’t his only act of bravery. According to the newspaper, when, on another occasion, one of his comrades was hit by a bullet and fell into a dried up river bed, Lawson carried him safely to camp. According to military records, Lawson soon returned to his regiment and served until 31 October 1902 including in South Africa during the Second Anglo-Boer War. He received further military medals and clasps for this period of service. On 14 March 1908, Edward married Robina Ursula Scott, who was known as Ursula. At this time, he was living at 128 Malcolm Street and working as an electrical wiremen. The Lawsons soon moved to 14 Matthew Street, South Heaton just north of Shields Road, where they brought up their six children. Matthew Street was their home until c1924 (when Edward was 51 years old) at which time they relocated to Walker where they were to live for the remainder of their lives. Prior to and during the First World War, Edward served as a Company Sergeant with the Northern Cyclist Battalion, which was employed to protect the coastline. The battalion was based at Alnwick Castle during World War One. The next photograph shows men of the Northern Cyclists in 1910. Edward Lawson VC is seated at the front. 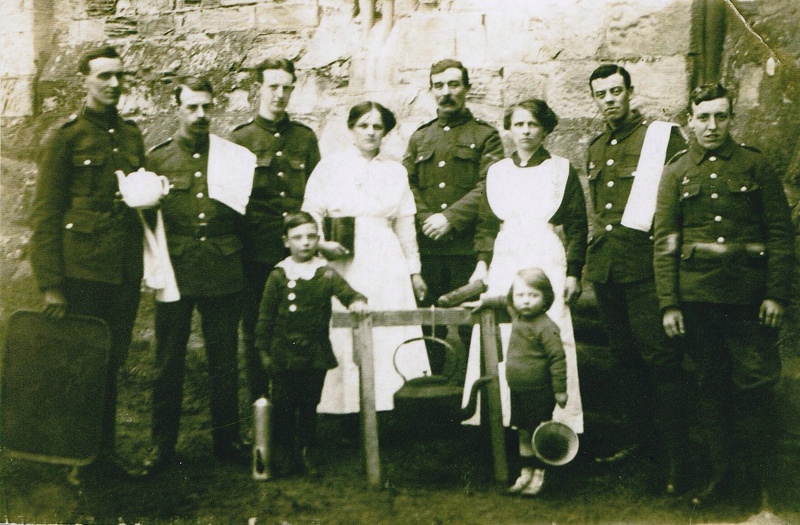 The next photograph was taken at Bamborough Castle in 1914. Edward is fourth from the right on the back row. Left of him is his wife Ursula, right of him is sister-in-law Agnes (known as Lily). Both were employed as cooks to the officers mess. Front left is Thomas and right front is Arthur, both sons of Edward and Ursula. Edward Lawson VC died on 2 July 1955. He is buried in Heaton and Byker Cemetery, where in 1999 a new headstone was erected on his grave. His Victoria Cross is held by the Gordon Highlanders Musuem in Aberdeen. Read here about a memorial to Edward and the other two Newcastle men to have been awarded the Victoria Cross. This entry was posted in Research and tagged Chillingham Hotel, cyclist, East End Hotel, Edward Lawson, Heaton and Byker Cemetery, Malcolm Street, Matthew Street, soldier, Victoria Cross, WW1, WW2 on June 2, 2014 by oldheaton.